I'm pretty sure I just doubled the number of people I'm following. erindalc is your avatar from a magic-the-gathering card? Artstyle and theme look about right. Not sure. 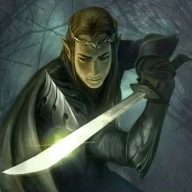 I googled elf warrior believe it or not. Found a nice picutre. Hopefully no one will confuse me with Nojr now. No. I like this one. So I'm giving modding a try. We'll see how this goes. DireChyymeras and RealKC like this. Dang I missed my forum anniversary...I've been here a year. My opinions are my own and do not represent the opinions of any organization or group I'm associated with. I typically go by erindalc, erindal, or erindalcuthalion. If you see any of those, it's probably me.